The play isn’t easy. Antoinette Nwandu has written fiercely brilliant dialogue saturated with ebonics and “niggas” spun into its vernacular. The word is used so much that the one white character in the play points out his discomfort with the frequency of the word. Now might be a good time to mention that I’m a Black Chicago-based director. Hi. Pass Over is like nothing Steppenwolf has produced before. The cast includes only one ensemble member: the young, Black and electric Jon Michael Hill. If most of the work by Black playwrights produced at Steppenwolf sounds like Miles Davis or even Frank Ocean, Pass Over has the potential to sometimes sound like Young Thug or Migos (and if you don’t know who those artists are, my point exactly). 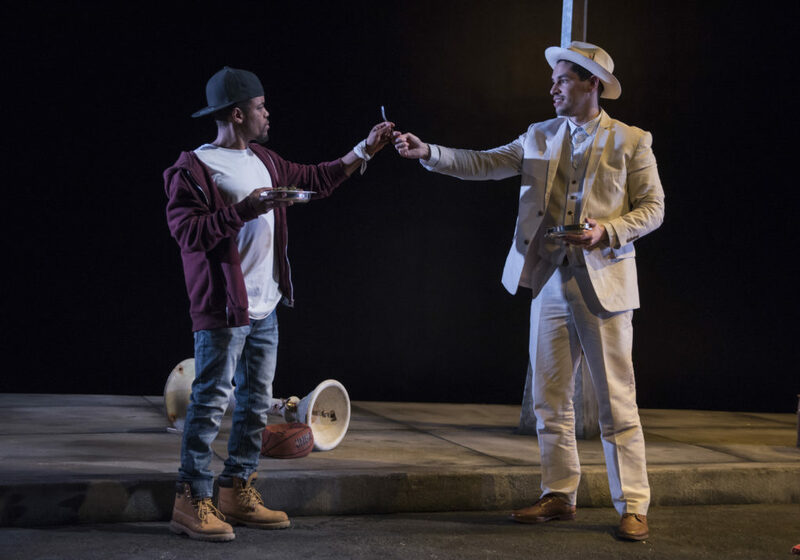 The play’s story is nebulous and has definite surrealist undertones, the likes of which infrequently occur on Steppenwolf’s stage, and are relatively foreign to Chicago Theatre audiences in general. The Chicago Theatre criticism roster consists of Chris Jones (Chicago Tribune), Hedy Weiss (Chicago Sun-Times), Kris Vire (TimeOut Chicago), Tony Adler (Chicago Reader) and many, many blogs. I’ve been reading Chris Jones for the Chicago Tribune since I was a freshman in high school almost fifteen years ago. Before I went to school, I’d eat Pop Tarts and read the TEMPO section in the Trib. My parents didn’t get the Chicago Sun-Times. Hedy Weiss has been the Theater and Dance Critic of the Chicago Sun-Times since 1984 according to the Sun-Times’ website. At this point, her reviews read like Trump tweets — simplistic, unbelievably insensitive, factually wrong, and mostly useless. For many years, the Chicago Theatre community has tried to get her off the job. We’ve tried writing to the editor, but America is more likely to impeach Trump than the Sun-Times is likely to fire Hedy Weiss for a racist review. The difference between the two is while Trump has been saying horribly offensive statements in his job as president for 6 months, Weiss has been doing the same thing for over two decades with no repercussions. Here’s an excerpt from her review of Pass Over. Her work oozes with an ironic ignorance for a woman that writes at a liberal newspaper where I’m sure there are plenty of resources for her to dig a little deeper. (It’s especially ironic because that final monologue she’s referring to is actually aimed at conservative white audiences, but that went over Weiss’ head.) She has a history of reviews like this that are either ignorant or unintelligent and often both. The New York Times covered one of Hedy Weiss’ controversies in an article almost 11 years ago and compiled quotes from various esteemed artists who spoke out against Weiss. This includes Tony Kushner, who she infamously referred to as a “self hating Jew” in her review of his Tony Award winning musical Caroline, or Change. Yeah. That’s one of our top two critics. And the issue is never whether or not artists can tolerate a bad review. Artists receive bad reviews all the time. After reading a Hedy Weiss review I find myself wondering if we even saw the same play. It seems like she willfully ignores how a play is structured and the story it’s trying to tell. Her work is unbelievably offensive, it spreads negativity about positive work being done in the theatre community, and it affects the artists who work on these new play processes. I keep finding myself wanting to shield the actors on stage at Pass Over. I can’t imagine performing this play every night, exposing parts of yourself, and being met with the negativity and false information spewing from critics like Weiss. By continuing to invite her and use her pull quotes, theatre companies are sending a message that they are complacent to her bigotry. What’s worse (okay maybe not worse) is she doesn’t even sell tickets. Before moving into directing, I was the Communications Manager at Next Theatre Company. I was in charge of marketing, audience services, and graphic design. In my experience, including a Hedy Weiss review on our poster, postcard, web ad, or lobby display did nearly nothing for ticket sales. Her words are not only damaging to artists, but also the audiences who are misguided by her wrongheaded reviews. The Chicago Theatre Accountability Coalition was formed in response to Weiss’ Pass Over review. Enough was enough. The coalition is organizing artists and producers from all across the city to contact Chicago theater companies, asking them to join the cause and promise they will no longer provide Hedy Weiss with free tickets to their shows. They send out daily tasks to their group members to dismantle a failing system in a peaceful and controlled manner. Weiss is welcome to attend any show she wants to review – so long as she purchases a ticket. Over 3500 people have signed the petition and over sixty theatre companies have signed. You can find the full petition by clicking here. I can’t stress this enough – my beliefs written here are not at all indicative of this pleasant, honest, and peaceful group. The Chicago Reader, The Chicago Tribune’s Editorial Board, and The Chicago Sun-Times have all come out in support of Weiss. The articles that the media have released thus far omit facts and Weiss’ precedence for offensive reviews to almost shocking degrees. The Sun-Times wrote that they “may have room to grow when it comes to covering the diverse communities we serve, including in the arts. Our promise every day is to continue to do better. We do that, always, in the best of faith.” There’s been no evidence of the Sun-Times making any attempt to “do better” in the past. For a lot of artists in Chicago, the issue ends here: keep Hedy from receiving free tickets. I’m also in favor of focusing our efforts here. But Hedy’s overt racism is not the full story behind Chicago’s troubled relationship with criticism. Most theatre companies in Chicago have one primary marketing strategy: get a 4-star Chris Jones review. The difference between a 3-star and a 4-star Chris Jones review is the difference between average and packed crowds. Notice I didn’t say a Chicago Tribune review, but specifically a Chris Jones review. Jones’ review of Pass Over was, I’d say, mostly a rave. The review is one of Jones’ more comprehensive reviews. He identifies specific strengths of the work and displays an understanding of the playwright’s intentions. I would even argue that Chris Jones accurately analyzes the complex race issues that are stirring in the play. As a critic, Jones has a set of values and priorities that result in an aesthetic preference. I can not pretend that I know Chris Jones. What I have surmised about Jones from reading him since I was 14, is that he values an honest performance and honestly written characters . He prioritizes stories that are deeply cathartic and filled with pathos. He wants text that feels real to him. And realness must be subtle. It must have verisimilitude. It must be authentic, or at least feel authentic to Chris Jones. These priorities and values are often the backbone of his reviews resulting in a specific aesthetic preference. Steppenwolf’s previous work and a lot of work created by ensembles in the city fall under this aesthetic. Pass Over does not. Symbolism is not Chris Jones’ bag. Heavy handedness is not Chris Jones’ preference either. Nwandu’s finale sports both symbolism and heavy handedness with grace. Jones doesn’t like the ending so much so what star rating does the play get? 3 out of 4 stars. Though Jones can see why Nwandu made the choices she made, it wasn’t his preference and so it affected the play’s rating. Jones felt the ending extinguished the humanity in the play’s characters. When I left the theater after Opening Night, I remember saying to my wife that it’s interesting to me that artists of color tend to write and create in a world that doesn’t sit comfortably in realism. I can watch a magical or surrealist moment and it will ring more true than if the moment was played “realistically”. Because what’s “real”? What’s “true”? Is Chris Jones’ truth more important than my truth? I don’t need a critic to tell me how they would tell my story. I’d rather they try to empathize with the way I’m trying to tell it. The end of “Mary Page Marlowe” is deeply frustrating. So much so, in fact, I wondered about the four stars. But my internal debate — as unremarkable as the life of the protagonist — ended when I thought again about the emotional weight of a piece of theater so imbued with love and concern. And so this relatively realistic play was awarded a 4-star review and here lies the problem. We hear a question asked again and again when a play like Pass Over drops: how can we make room for people of color in theatre criticism? This is true, valid, and needed, but the issue might be broader than that. Chicago Theatre has a very specific aesthetic: intimate, realistic, honest, ensemble-based, text and performance-based theatre. And although these are values and priorities close to Chris Jones, this is an aesthetic that goes back to when Steppenwolf Theatre operated out of a church basement. This aesthetic reaches back to Gregory Mosher’s early productions of David Mamet at the Goodman Theatre in the 1970s. It’s a proud tradition, but it’s also a trap. We create plays that we think will attract a Chicago Theatre audience, whatever that means. We think we know what they can handle and what they can’t. We produce plays that we think Chris Jones will enjoy. We say “chicago audiences” in artistic and marketing meetings but we’re really saying Chris Jones. We are inspired by Chicago productions before us and artists working with us and we don’t look outside of the city that much. Our work is intimate, small and intentionally claustrophobic. We produce plays that are socially relevant. These plays are allowed to ask a question, but never venture to give an answer. If you give an answer, you’re being preachy and not subtle which are the two worst things you could be. Instead, you better have 5 characters in a room that all have different perspectives that are equally valid trying to answer one question. Argument escalates, climax, denouement. We tell Chicago stories. We lead with our actors and playwrights. We shy away from devised theatre. Experimental Theatre? What’s that? We stay here, we keep our heads down, and we do the work. When something adventurous comes into town, we get inspired, maybe we steal something small, and we go back to our aesthetic again. I am comfortable saying that as a white man, Chris Jones cannot have the same priorities that I do as to how Pass Over’s story is told. In a broader sense, Chris Jones is a realist, and therefore doesn’t have the same priorities that I do as to how Pass Over’s story is told. He can forgive a realistic play’s frustrating ending, but won’t penetrate a surrealist play’s ending. Your perspective is built upon what you’re willing to forgive. This isn’t a petty complaint over a single star. I’m asking the question: are we letting our critics dictate the type of stories we tell and how we tell them? Do we keep our adventurous ideas away from Chicago audiences and our intelligent ideas from Chicago bloggers? As evidenced by Weiss and Jones’ reviews, who’s allowed to have a successful production in Chicago isn’t necessarily only an alleged race problem, it involves anyone that wants to try something risky on stage as Nwandu has done here. Believe me, I’ve been deeply offended by overt and “well meaning” racism across Chicago theatre criticism. Critics and media companies almost never apologize for it. It’s easy to point out and it affects the work that is programmed. I’ve also seen strange play after play fail in Chicago and succeed elsewhere. At this point, Chicago audiences really might not be trained for experimental work because of how ill-equipped our critics are at covering that material. Though I wouldn’t call it “experimental”, Pass Over was a risk for Steppenwolf. Chris’ review broke my heart more than Weiss’. I expect a racist review from Weiss. I saw it from a mile away. This isn’t nearly the first time I’ve been disappointed with how Jones has watched a play. I’ve read that review in response to that type of work too many times to not notice a pattern – and I’m not the only one. I’ve talked to directors outside of the city who direct wonderfully successful productions elsewhere and won’t step foot in Chicago for this exact reason. As a producer, I’ve worked for companies that are too intimidated by Jones’ preferences to produce adventurous work. I actually think Jones is still an excellent writer, one of the best in the country. I think he writes from an honest and authentic place. He writes from his truth. But I wish he would display an ability to appreciate work outside of his preferred aesthetic and see someone else’s truth. I think it’s hurting our city. I don’t like articles that simply state the problem and don’t provide solutions so here’s some thoughts. The responsibility to evolve the work that Chicago produces and to widen the Chicago Theatre aesthetic is in our hands. Don’t invite Hedy Weiss to your opening nights. Plain and simple. Don’t do it. There’s no reason to be complicit in her bigotry. The Chicago Tribune hires a few critics to write their reviews. In the print newspaper and on their website, they include a section called Chris Jones Recommends showing the highest rated plays in Chicago. This omits any 3-4 star reviews from Kerry Reid and Nina Metz who cover the more adventurous theatre in Chicago. This section should change to the Theater Loop Recommends to include all of the excellent theatre in Chicago and not just the work Jones covers. Based on the current structure of the Tribune website, it seems as though the two female critics’ opinions are considered not to hold the same weight as Jones’ recommendations. At the very least, the Chicago Tribune needs to provide more freelance opportunities to fill out the diversity holes in their writing staff. Support Rescripted, a diverse and “artist-led interactive commentary on the state of the arts, including reviews, dialogues, and essays.” Invite them to your shows and use their reviews for your pull quotes. Make the theatre that inspires you. Make the passion project that feels out of this world. Produce theatre that feels bigger than Chicago’s critics. Produce theatre that feels so ambitious that it has the potential to go viral. And don’t settle. Excitement is contagious. There are so many types of theatre that don’t exist in Chicago. Produce for a reason. When I was in college, I used to gush about Chicago theatre. I would say the best theatre in the country was in Chicago. I would say there was a great variety of theatre in Chicago. I would say if there was going to be a theatre revolution in America it would be in Chicago. When I got back here, I realized that this great variety that I spoke about was based on a select few companies in this city (still around) that provide something truly unique. I started to read Jones’ work because my parents took me to Chicago Theatre when I was 13. Sometimes when I see work in our beautiful city it feels like I’m traveling back in time. Sometimes it feels like nothing has changed — and not in a good way. Sometimes it feels like we’ve passed the same toolbox down from generation to generation and therefore our work looks exactly the same as it did then. I still believe Chicago can have that variety and that we can have a diversity of voices and styles on our stage. We have to dare to evolve — despite our critics. Hi Monty. Thanks for this thoughtful response to the controversy. I haven’t seen the play yet–Emily and I will see it soon–and I’m not ready to weigh the arguments as volleys are fired back and forth. Weiss’s objectionable paragraph about policing seems to stray from the play into a thicket of contentious policy debate. It also seems tone-deaf to the dramatic intent of the playwright. But is it evidence of racism? You point out that this review fits a larger pattern but, apart from the reference to Kushner, I missed the other examples of bigotry and racism in Weiss’s work. I’d like to hear more. I thought your other comments about the theatre community and suggestions for making it healthier were on the mark. Thanks again. As a white, male critic who has covered the Chicago scene since 1988 I have to say I thoroughly enjoyed this carefully thought out, well-written essay. I am not going to write a full reflection on this piece, but only I am going to look for more essays from you, because you say things I want to read. This observation really hit home: “When I left the theater after Opening Night, I remember saying to my wife that it’s interesting to me that artists of color tend to write and create in a world that doesn’t sit comfortably in realism. I can watch a magical or surrealist moment and it will ring more true than if the moment was played “realistically”. ” In this I hear the tang of truth. Theatreinchicago.com thal posts all the reviews and even lets a reader see an overall star ratings. This article is beyond informative, it is a rallying call, a manifesto, a deep and complex narrative on the state of theater criticism and its impact on season selection, and invariably on the dearth of theater by people of color and women that make it to the stage in any significant way. Thank you! Sorry I’m getting into this discussion so late, but I did want to say that I hope this thought-provoking piece prompts a lot of self-examination and discussion. The Chicago theater scene does seem to be in a rut right now, and Mr. Cole is right in saying that the critics (I’m one myself) are part of the problem. We do need new voices open to approaches beyond kitchen-sink realism. We need artists, critics and audiences open to imagination and vision and risk and complexity. So much of what I see seems like long-form TV. We have so many theaters but so little sense of purpose … much of it is just yuppie diversion. I think this is what Mr. Cole is getting at: in a time of real crisis at every level, we need theater to become important again, and we need critics who are sensitive to context, message, subtext, symbol … the literary values that give drama its depth and power. P.S. Why no mention of New City? We’ve offered thorough, comprehensive coverage of Chicago theater since the 1980s. What are we, chopped liver?